I’ve been working my way through a backlog of “business” type books that I have piled up here and the most recent one I’ve gone through is Gary Vaynerchuk’s latest, #AskGaryVee. For those of you unfamiliar with Gary Vaynerchuk, he’s kind of an Internet marketing / business “superstar” who keynotes a lot of events and runs his own media company, VaynerMedia. He got his start online with his work at Wine Library and has always been at the forefront of emerging technology as it relates to business and communication. On top of all this he’s an investor in quite a few startups, so he has a pretty tight knowledge of the tech business space. 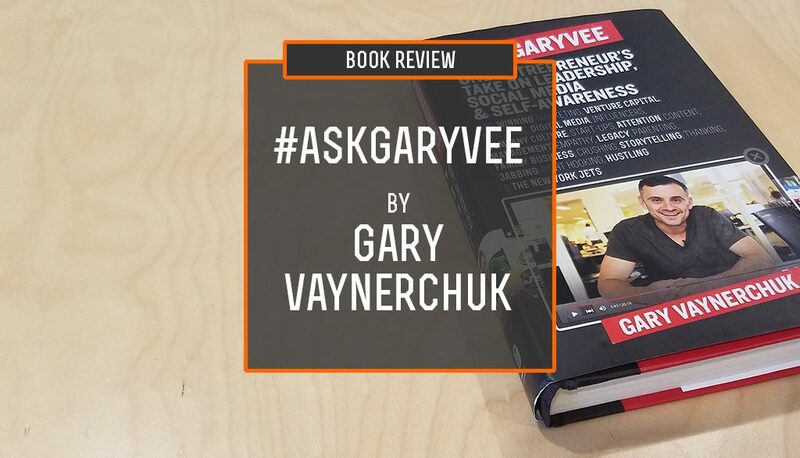 This latest book, published in 2015, is an offshoot of his online video show, #AskGaryVee, where he talks about tech, business, startups, leadership etc. and focuses quite a bit on interaction with his show’s viewers. At the outset here though I need to make one thing clear – I am not an #AskGaryVee viewer. I’ve actually never seen one of the shows – but I’m still familiar with him and his work through his social media presence (Twitter in particular) as well as his first book, Crush It. That said, I honestly think this book is a great introduction to Gary Vaynerchuk – and might actually serve more purpose to those of us who don’t watch the show than those who do. You see, this book is a sort of “greatest hits” collection of different topics he’s discussed on the show, curated and condensed into short readable snippets. Considerably different from his other books, #AskGaryVee jumps around subjects quite a bit, but gives some meaningful perspective on a lot of topics while it does so. It’s an interesting format for a book, especially in that it doesn’t go deep into the weeds on any particular subject so much as it gives the reader a good perception of Vaynerchuk’s personality, his approach to business, and how his no-nonsense, goal-oriented approach has helped him succeed. The only issue I had while reading it was the same issue anyone might have with Gary – he can come off as a bit pompous. The good thing is, he knows it. I get the distinct feeling that if I were to ever meet Gary in real life we’d get along alright, but he’d be less than impressed with my approach to how I handle a work-life balance, and it can get a bit frustrating to read continual viewpoints from someone who approaches business from such a different angle than you do. Still, he has good points and he does a great job at inspiring you to get to work and “hustle” as he calls it. No doubt the man is extremely talented and has a lot of information to share – and it’s a great read to go along with other leadership books. The biggest result of reading this for me though has been that he’s inspired me to read another of his books, Jab, Jab, Jab, Right Hook. He talks about it a bit in here, but it’s a pretty brilliant approach to marketing and business, and one that makes even more sense now in our era of content marketing. So should you read #AskGaryVee? Probably. With the way it’s broken up into snippets it’s a good one to keep at your side to read in short sittings. Don’t expect it to give you huge insight into strategy, but what it will give you is huge insight into the thoughts of a man who absolutely has “crushed it” in our new economy.